Software buyers and decision makers are hungry for impartial information about the many different solutions available. TEC’s Vendor Showdowns are a good way for them to see where different vendors are functionally strong or weak. Technology Evaluation Centers (TEC) is pleased to announce the launch of its exclusive Vendor Showdown series. This will be a regular TEC feature, spotlighting head-to-head functionality contests between top enterprise resource planning (ERP) software solutions in the most common types of environments, such as discrete manufacturing and process manufacturing. Each Vendor Showdown will feature two or more leading vendors battling it out over the full range of features and functions in the enterprise software space they compete in. Points are awarded according to how well the competing solutions support thousands of features and functions, based on vendor-supplied data pre-loaded into TEC’s industry-leading database. TEC’s software vendor database contains detailed information on over 1,000 enterprise software solutions across more than 25,000 different software selection criteria. Scoring ranges from 100 for “supported out of the box” to 0 points for “not supported,” along with eight intermediate scores that reflect varying levels of support to reflect supported via, for example, a third-party solution, customization, or modification. The results feature an overall winner, along with detailed graphs showing how well each solution performs in the main functionality modules and submodules featured in the Showdown. Visitors viewing Vendor Showdowns are encouraged to use TEC’s patented decision support system to run their own, free customized vendor comparisons based on the specific needs of their own organizations. TEC’s Vendor Showdowns are another way the world’s leading provider of software selection resources, services, and research materials helps its members gather the information they need to evaluate and select the software solutions that best fit their organization’s requirements. TEC’s Vendor Showdown series kicks off with a three-way contest between veteran providers of ERP solutions for manufacturing: Infor, Sage, and Epicor. 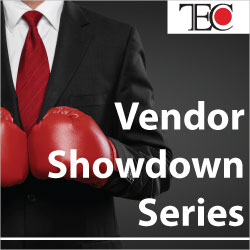 For more information about TEC’s Vendor Showdown series, contact us at +1-514-954-3665, or online.